What does it really take to retire? | Northeast Benefit Services Inc.
Posted on December 5, 2017 at 10:33 pm. As a plan sponsor, your employees rely heavily on your guidance; after all, you manage the plan that may offer their best shot at a successful retirement. When the 401(k) plan was introduced in the mid-80s, it was not intended as a standalone solution. However, as time evolved, defined contribution (DC) plans became the primary savings vehicle for Americans, while originally, they were intended to be a part of a three-pillar system including defined benefit (DB) and social security. Saving for retirement now rests predominately on your employees and they look to you for guidance. Are you helping position them for success? It may not come as a surprise that 81% of Americans say they don’t know how much money they’ll need in retirement. But let’s be honest, most people’s minds begin to drift when you start talking large numbers and percentages. So, let’s break it down in a way that may actually make an impact on your employees! How much do they really need to retire? The short answer: many industry experts suggest putting away 10 percent annually or more for a meaningful retirement, but the average deferral rate is only 4%. So where is the disconnect? Often plan sponsors fear pushback from employees when it comes to making plan adjustments that may decrease their weekly paychecks. However, surveys reveal that participants look to their employers for nudges to save. A helpful way to encourage more savings without adding a large cost to the plan is through effective plan design. In a previous article, we discussed six plan design basics to help you build a custom plan. [Link to RPM_Q4_Article 1] In this article, we challenge you to explore a few advanced plan design features. You may consider stretching the company match, implementing auto-escalation, or offering a cash balance plan. It’s been long accepted that you should “contribute to the employer match.” As an employer, why not act on this popular belief? If your plan utilizes a typical match formula of dollar for dollar up to 3% of pay, you may consider a stretch option. For example, you could match fifty cents on the dollar up to 6% of pay. This simple scenario would keep employer contributions at 3% of pay; and with the stretched formula, employees would be incentivized to save more. You may consider a more subtle approach that would enroll your employees at 4% and automatically increase each year by 1% until they reach that a target rate of 10%. Your employees may even thank you. Based on a survey by American Century, seven in ten participants showed interest in a regular, incremental automatic deferral increase. A cash balance plan may induce a bit of nostalgia from the yesteryears of the traditional pension plan, but with a 401(k)-style twist: they combine the higher benefit limits of a DB plan with some of the flexibility and portability of a 401(k) or profit sharing plan. This unique plan design option may help business owners with a significant tax deduction for employee contributions, plus generous tax-deferred retirement contributions for themselves. Inspiring your employees to save may seem daunting at times, especially if you fear to push back on implementing new strategies. 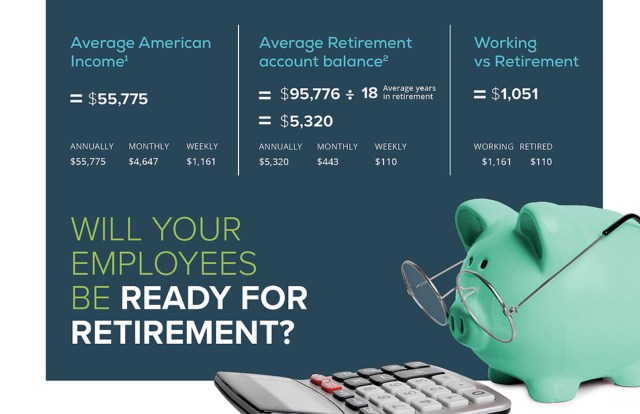 But, a significant point of offering a retirement plan is to help your employees get closer to their retirement goals. Exploring options such as those in this article may help you reach organizational goals such as recruiting and retaining valuable employees while helping them to pursue their goal of a successful retirement. For information or help in implementing these plan design features, feel free to contact us to set up a conversation. Department of Numbers. “US Household Income.” Sept 2016. Morrissey, Monique. “The State of American Retirement.” March 2016. Aon Hewitt. “2015 Trends & Experience in Defined Contribution Plans.” 2015. American Century Investments. “Fourth Annual Plan Participant Study Results.” Aug. 2016. Johnson, Angela. “76% of Americans are living paycheck-to-paycheck.” CNN Money. June 2013.